What can we expect in today's Argentine Grand Prix? It's unlikely that we'll see anyone compete with Marc Marquez over the course of a 25 lap race but the Yamaha's of Jorge Lorenzo and Valentino Rossi should be able to offer some resistance to the Honda rider. Suzuki have been fast throughout the weekend and with Aleix Espargaro on the front row if he can make a fast start he could be a fly in the ointment for Marquez in the early laps. That could give Ducati a sniff of victory this weekend. The track layout doesn't play to the strengths of the GP15 but that's not to say that the red bikes won't be fast. The main issue for Ducati will be maintaining tyre life but the balance between speed and consistency looks to be too much for Dovizioso and Iannone due to the nature of the hard tyre and its wear rate. Moto2 and Moto3 look set to be exceptionally competitive with Oliveira on pole in the small class and Zarco at the front in the intermediate class. Danny Kent and Sam Lowes have the pace in these races but they'll have their hands full during the races. Another race and another pole position for the Spaniard. Any questions about his strength in 2015 has been put to rest over the course of the last week. After making a mistake in Qatar and falling down the field Marquez answered back with a superb performance in Texas and his pole lap in Argentina was another measure of his greatness. 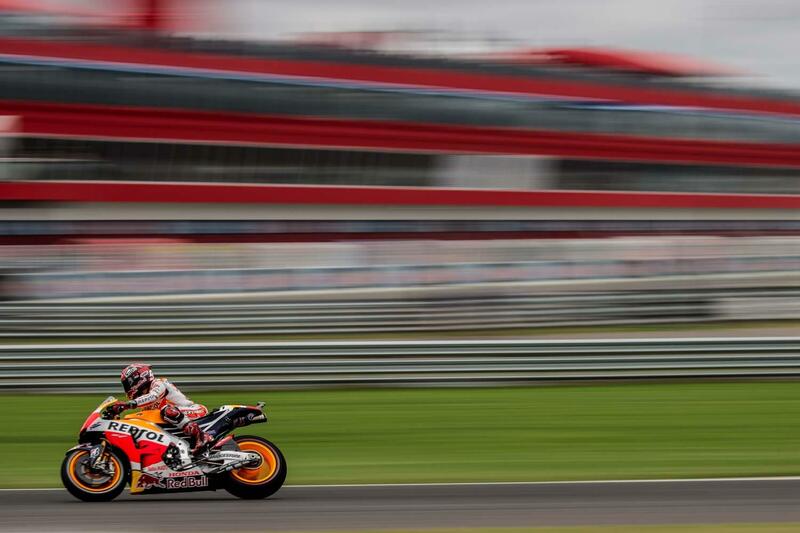 While not on a par with the raggedness of his COTA effort the lap was still another example of how Marc can eke out more one lap speed from his package than any other MotoGP rider. That he is unquestionably the fastest rider in the world, in terms of ultimate pace, hasn't been a doubt for the last two years but yesterday showed again the key benefit of that speed. Whereas Rossi and Lorenzo will have to fight through a pack containing the Ducati's, Crutchlow and Espargaro Marquez may already have opened the necessary lead to claim another win. Espargaro will be quick in the early stages and Iannone looks to be riding exceptionally well but unless they can get the jump off the lights no one will see which way Marquez has gone. Marquez' qualifying strategy saw him undertake three runs during the 15 minute session and because of that strategy he didn't have enough fresh tyres to have a new set for each run. That was of little consequence however with the circuit record smashed by the Spaniard. "The pole position was nice, because we used tires on the rear to try to avoid the pole position of the extra soft, and we did it," said the pole sitter. 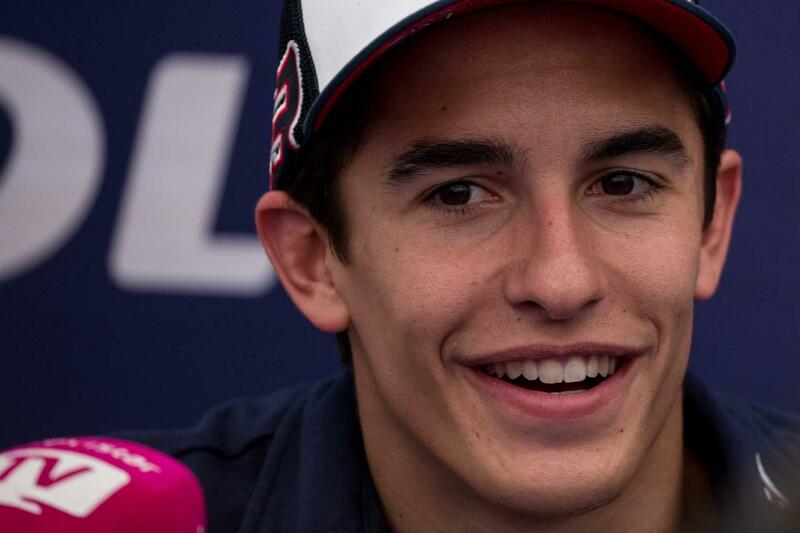 "In the race we know that the main opponents are on the second and third row, which are Valentino and Jorge. What we saw in FP4 was that Jorge and especially Valentino had a really good pace.
" Iannone start on the front row, I that he is a tough rider in the beginning, and normally he start really good, so it will be a nice first laps, but we will try to stay calm and to understand the situation, because in the end, we know that the most important part is the second part of the race." Chattering has been a constant bugbear of Suzuki recently so there's no chance that Aleix Espargaro will be able to convert a front row start into a podium but this was an exceptional performance from the Spaniard. While his pace on the softer Open class tyre was noted throughout last year this was another example of just how fast Espargaro is. 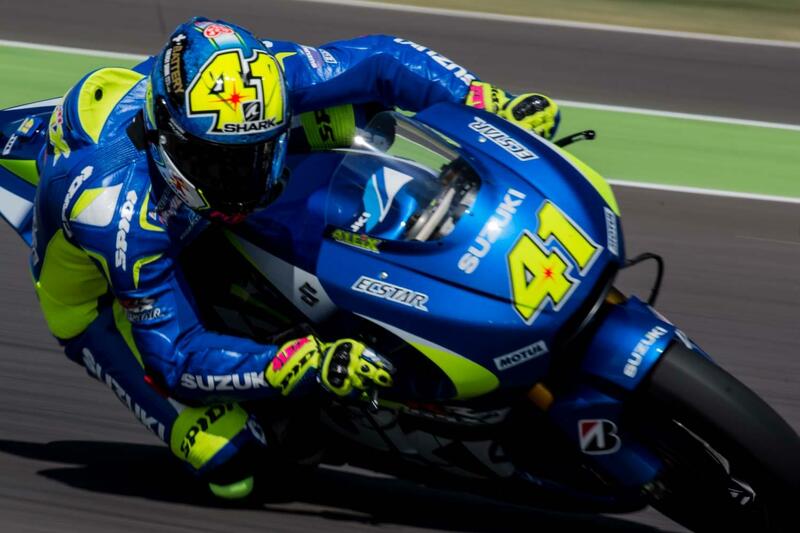 While the Suzuki isn't yet capable of competing with the other factories their progress since their MotoGP return at the season ending Valencia Grand Prix has been incredible. In that race Randy de Puniet barely looked to have a bike reliable enough to make it down to the chip shop now however the team look to be on the cusp of making some major waves in MotoGP. Espargaro is riding on the crest of that wave with his confidence sky high. We've never seen him riding this well from him in the past, even when he was dominating the CRT and Open classes over the last three years. Espargaro was not truly given the respect that his performances deserved but that is starting to change. Now however armed with a factory behind him he is riding incredibly well and starting to receive the respect that he deserves. "I pushed like a beast and did the maximum I can," said Espargaro." With the second tire, the time I did was great, but then I stopped in the box, I went to the TV and I thought it was a mistake, P2, half a second from Marc, So with the third tire I gave with 100%, but it was even worse, because I made more mistakes. It's difficult to beat Marc in one lap, even with the soft tire. "I'm really happy with the result today, really happy because it's just race three, and I think for everybody in Suzuki and for me it's going to be good, we are really happy, we are working hard. Even if the bike is slower than the rest, we are working really hard trying to improve everything. Really happy, and try to stay close to the podium tomorrow." Espargaro's crew chief, Tom O'Kane, has spoken to Motorcycle News about how mature Espargaro is and how he has been able to motivate the entire team. These traits are what any top rider needs but the third trait that O'Kane has mentioned since the start of the season is maturity and when you have a fast, confident rider that is mature enough to understand that patience is required it makes for a much easier time developing a motorcycle. Espargaro ticks all these boxes and the work being undertaken by Suzuki to develop the GSXR-R will mean that soon the bike will be able to compete at the front in races rather than just in qualifying. Jorge Lorenzo and Valentino Rossi qualified down the field on the second and third rows but the Yamaha duo have the speed to be contenders during the race. Rossi in particular showed a consistency in FP4 that should see him very strong over the course of a race distance. The Italian struggled in qualifying but given his struggles with the extra hard tyre on Friday the progress made by Yamaha on that tyre gave him plenty of hope for the Grand Prix. "e worked a lot for improve the pace with the extra hard," said Rossi. "This is the target because we think that the race will be with the extra hard. Sincerely we made a huge step from yesterday, more than one second. The track has improved and the temperature helps the extra hard, but also the setting." Just as in Qatar Rossi has plenty of room for improvement in the morning warmup with the nine times champion saying that there are "a couple of corners that I need to improve." Traffic and mistakes in those corners cost him any chance of starting on the second row but his rhythm is good on longer runs and he should be a real contender during the race. Lorenzo will start from fifth on the grid and his plan for the race was simple, " Hammer… Hammer in all the laps!" It could be argued that Ducati may well have the most balanced bike on the grid but in Argentina the potential of their bike will almost certainly be hindered by their tyre allocation. The abrasive and slippery track surface means that tyre wear is exceptionally high this weekend and with Ducati's harder option tyre unlikely to be able to last throughout a 25 lap race it's unlikely that we'll see another Ducati rostrum this weekend. Andrea Dovizioso has finished second at both races this year but starting from the second row will make it very difficult for him to claim another rostrum finish. Iannone will start from the front row and being able to get into the lead at the start and controlling the pace is the only way that he'll have a chance of tkaing a second career premier class podium. Iannone rode well to qualify third and afterwards the Italian was philosophical about the tyre allocation by saying, "For sure I use the hard because I never try extra had. I don't have it in this track, but is a compromise, because the other track I have an extra soft with the other factory don't have. This is an advantage for me in the qualifying for sure. But OK, is a compromise, and tomorrow I focus for the best, try my best for ride well, and don't stress a lot the tires." Not stressing the tyres will be impossible if Iannone has to chase down any other rival. If he can get the jump at the start and set the pace he could give himself a fighting chance but it's hard to see any circumstance where the hard tyre will be sufficient for a 45 minute race at the front of the field. Dovizioso said that there was nothing special that Ducati could do during the race other than "ride smoothly" to keep the tyres as fresh as possible. 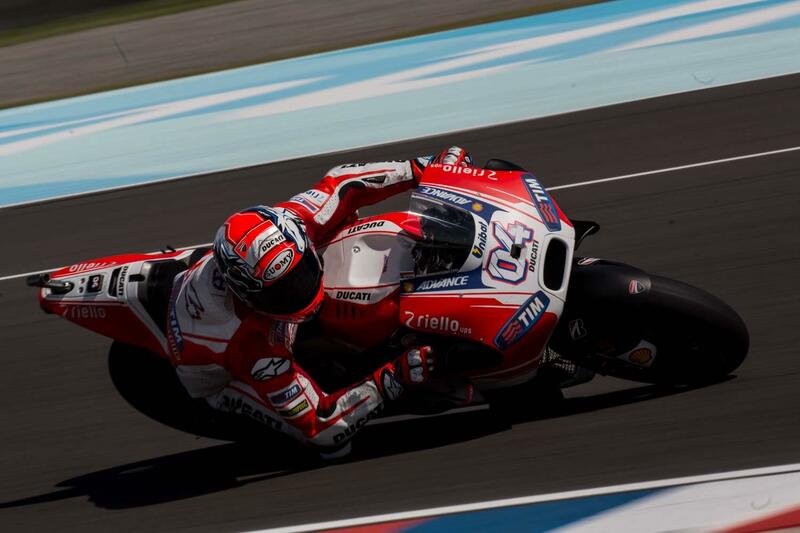 Dovizioso was pleased with his rhythm in FP4 but was surprised to qualify off the front the front row. A mistake on his hot lap cost him with time and likely a front row berth but overall he's pleased with the work that Ducati has done this weekend and their potential for the race. "We have the speed and that is really important. I’m really happy with the feeling on the bike and for the race. But there is a big question mark with the consumption of the rear tyre for 25 laps. It looks like the factory will use the harder rear tyre. We never know if is advantage or disadvantage. In any case I’m happy with the speed. We did everything we could. We have to see if we are smooth enough in the race to keep a good rear tyre." That Cal Crutchlow was upset with qualifying fourth came as a surprise to many but after qualifying he explained that he was blocked on two of his qualifying laps. Jorge Lorenzo and Maverick Vinales were the culprits and when this was combined with a mistake on his fastest lap it was clear that once again Crutchlow had the speed for a front row. Setting the second fastest time in the combined practice times showed how much potential Cal has this weekend but being able to consolidate that into a front row clearly would have meant a lot for the Englishman who has endured a somewhat disappointing start to the season with two seventh place finishes. 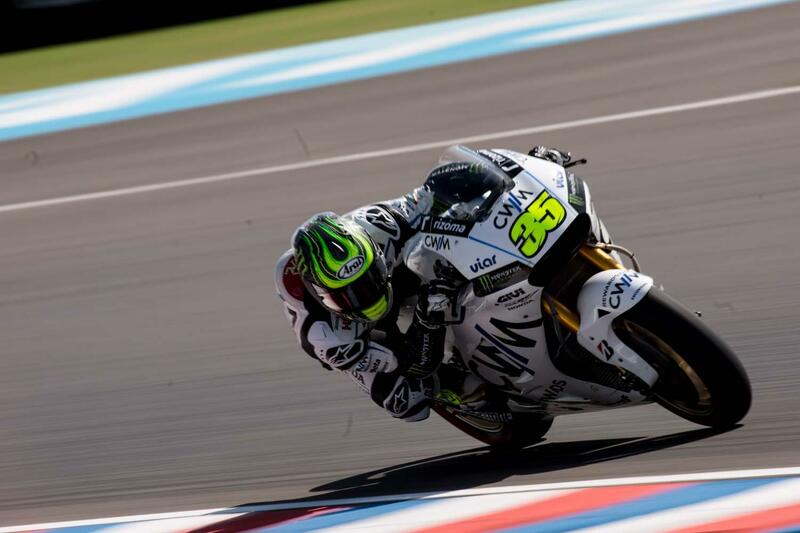 "I was very angry with my qualifying because we should have been second," simmered Crutchlow after qualifying. " I don’t want to be complaining. We finished fourth and that’s the way it is. I made one mistake on my own and missed a lap, but the other two times was due to slower riders. Lorenzo decided in the middle of the lap he wanted to go fast and then in the last sector he was really slow. "He looked behind him three times. He saw me coming. In the middle sector he started to push and in the last sector he slowed up a little. But I was still pushing so I caught him. I had to avoid him and go really wide. I just missed the entrance to the pit lane. That’s how wide I was. I was disappointed with that because he knew I was coming. Then in the last lap again I went to push and Vinales had finished his lap and just cruised around the first sector, on line. They need to get off the line if they are not doing a lap." 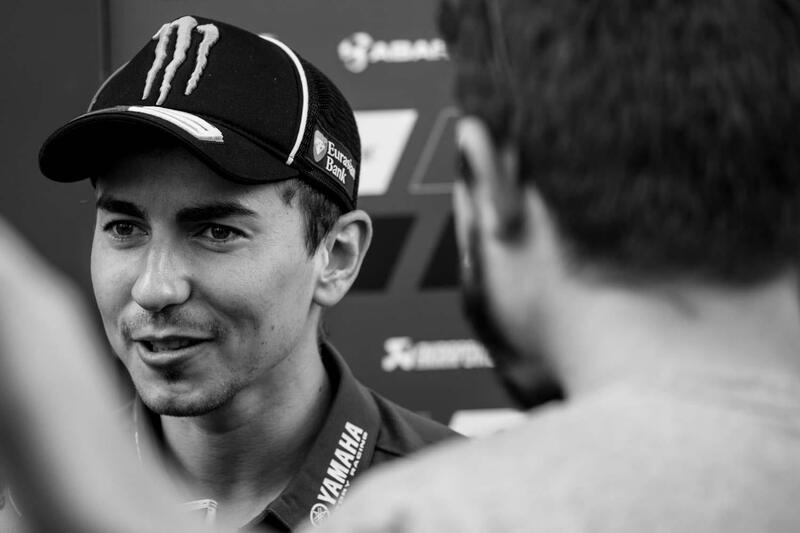 When Lorenzo asked by MCN about the qualifying session he passed the blame onto Vinales for shutting off and forcing him to slow down. The Yamaha rider said, " I was with Maverick. Maverick slowed down and I had to close the throttle. I didn’t see Cal, but probably it was Maverick who closed the throttle in the middle of the corner." Crutchlow has the potential to be a cat amongst the pigeons in the race but his inability to make the extra hard tyre work in practice will force him to start on the hard tyre. This will make the race a major challenge for him however he hopes that the extra speed in those first five laps will be key in allowing him to start strongly and hopefully maintain that speed. The former World Supersport champion is always a strong racer who can maintain his pace better than most and that will be crucial today if he is forced to use the hard tyre in the race. Eugene Laverty looked set to steal the headlines yesterday when the Irishman was on the verge of sensationally making it through to QP2 automatically. In vintage Superpole style Laverty managed to hook together a fantastic lap in FP3 to put him into the top ten but afterwards he admitted that he didn't actually push to 100% and filed away to memory the need to push to the maximum in the session to give himself any chance of making it through to QP2 automatically. "Austin was a glimpse of what we could do but we only showed it in qualifying. Today we 12th in FP3, 13th on race rubber in FP4 and qualified 14th so that's been our pace all weekend. FP4 gives us the most encouragement because in that session we did a nine or ten lap run and I was still seeing on the pitboard that we were in the top ten so that was really encouraging. Everyone knows from Aleix last year that with the soft tyre you can set one laptime but to be able to do a run of laps on the race tyre is really nice." 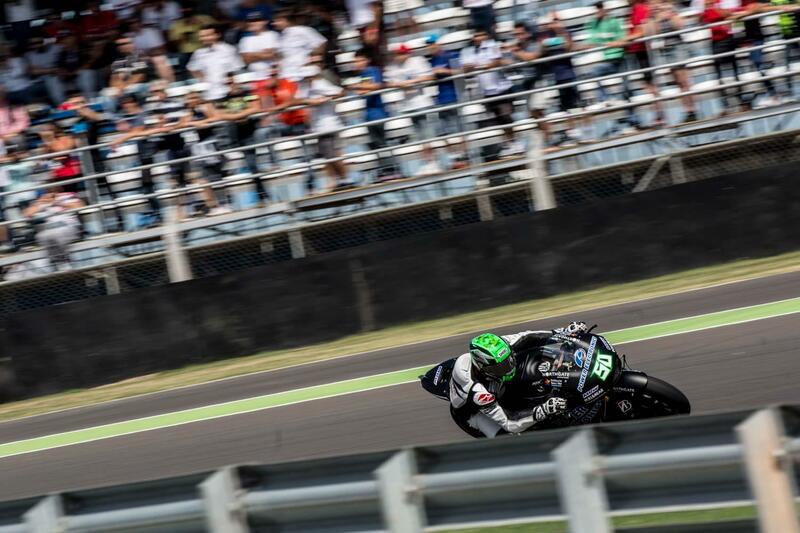 Scoring a point will be the target for Laverty but he believes that finishing inside the top 12 could be a possibility at a venue that plays to the strengths of the RC213vRS. The greasy track surface means that everyone is struggling for grip but it also gave Laverty an insight into how he needs to ride the bike to get the most from it. "This surface has been a really good lesson for me because it's almost like riding a MotoGP bike on a dirt track. Everyone knows how Marquez rides the Honda, he always makes it look slippery on entry because he backs it in so much, this track is actually helping me to learn that as well because it's easier to slide the bike like that. We'll need to take those lessons back to Europe and tracks with more grip but it's an important step. Having the rear out helps the bike to turn and Marc's the fastest guy in the world on that Honda so you need to try and understand what he's doing and the reason behind it." A late surge in qualifying saw Miguel Oliveira claim the second pole position of his career and relegate Danny Kent to second on the grid. Kent was once again setting the pace, and doing his times on his own, so while Oliveira was fastest the race looks set to be very competitive. "It was quite strange qualifying for me, because I couldn't do a fast lap time from the beginning," said Oliveira. "So even if this weekend was good for us, I was having a good pace and all that, the qualifying with the wind was quite stressful for me. But we could do it in the last minute, so I'm happy to get a pole position. Oliveira had struggled in qualifying until his final run but his speed in Qatar and Texas showed that he has the potential to finally claim his first career win. No Portuguese rider has ever won a Grand Prix but Oliveira is well placed to finally set the record straight for his homeland. 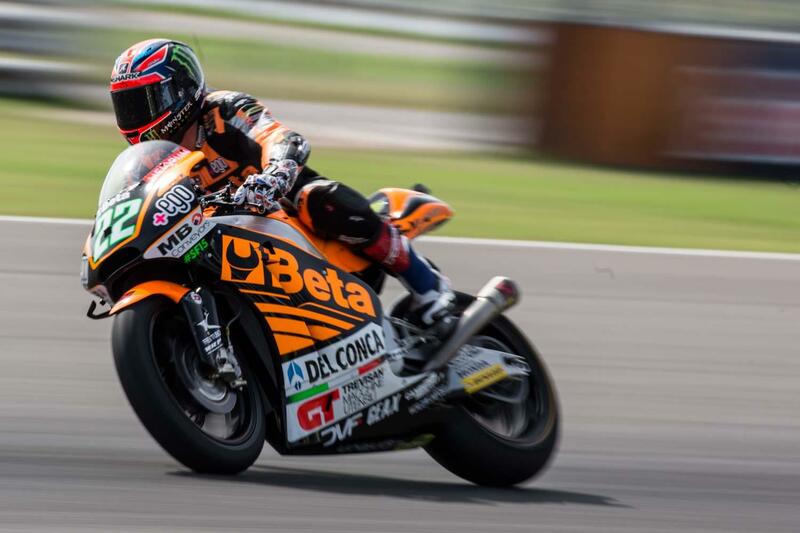 Quiet is not a word commonly associated with Sam Lowes but the Englishman is quietly confident about his chances in today's Moto2 race. Fresh from his Texan victory Lowes qualified on the second row but felt that his pace was strong in practice and qualifying. While he doesn't have the same turn of speed that he showed in the opening two rounds of 2015 he has been able to match the speed and consistency of anyone in the class this weekend. "Kalex bike is already very good, but if I work more, maybe I can be even better," said Zarco." The target was to [make it more comfortable] it here, and finally I was very fast and able to fight for pole position, so this is a very positive thing. It's also positive for the race tomorrow, because I must be easier on the bike to be able to be very fast and constant. I think I have many chances to win. But now I am in second place in the championship, so most important is to take many points. I will do my best for sure, and maybe try to go away if I can, but then I must use some strategy and see what happens." Lowes however has no doubts the he can match Zarco over the course of the race with another weekend of progress giving him plenty of confidence. "We're 18 places and two seconds better off than we were last year in qualifying so it's not too bad! The track temperature was a lot hotter and we struggled less than what I had expected us to do and I was doing my laps on my own as usual so it's a positive day. If I had a slipstream I would have been there but it doesn't matter to me, fourth is another good session. I had a lot of people trying to tow off me and it pissed me off so I just dropped them to get back with my programme. If you look at my times I did a lot of low 43's and Zarco and Rabat could do that but Zarco couldn't do a lot of them." Zarco, Rabat and Lowes have been the most consistent runners in Moto2 but this weekend looks set to be exceptionally competitive with Luthi, Corsi and Rins also in with a shout of the victory.